Children participating in the Lost Ladybug Search in Ithaca, NY, 2008-2009. Photo by Dr. Rebecca Rice Smyth of the Lost Ladybug Project. A week or so ago, as snow fell outside the window, I spoke with Dr. Rebecca Rice Smyth of the Lost Ladybug Project, which was started in 2008 to coordinate efforts to survey ladybug populations, first in New York State, and then, across the country. This blog post, as promised, will have lots of information on this wonderful resource, meant to help track the various ladybug species, and give a sense of which ones are losing ground and which are more dominant. The website, www.lostladybug.org, has step by step directions about how to look for, observe, document, and submit data and photos for ladybugs. The site contains links to two 4-H Science Toolkits designed to help teachers and others guide children in grades K-2 and 3-6 respectively in learning about, observing, and collecting data on ladybugs in their local area. The website and the toolkits both contain loads of fascinating information about ladybugs, including the interactions between native ladybugs and introduced Asian ladybugs. The website also includes a number of free-standing curricular units, besides those in the two toolkits. Ladybugs, both native and introduced, eat the same range of things. Ladybugs eat aphids, of course, and lots of soft-bodied insects and insect eggs smaller than themselves. Since many, if not all, ladybugs eat pollen as well, they may be found on flowers and corn plants, eating pollen. While on a corn plant, they may eat a tiny just-hatched corn borer larva (or the egg that preceded it), but only if it is accessible. They wouldn’t be digging in after corn borer larvae which have themselves bored into an ear of corn, so ladybugs aren’t a predator humans can count on to keep this pest from eating fields of sweet corn, so this essentially confirms what Dr. George Hamilton had told me for the preceding ladybug post. All species are capable of having multiple hatchings of eggs in a year, but the reproductive cycle gets interrupted more often and for longer periods of time in colder and dryer parts of the country and world. In other words, in New Jersey and other parts of the country/world where we have a true winter, a ladybug will go into diapause—remember, that is ladybug hibernation—and won’t begin to reproduce again until leaving diapause. There are many native species of ladybugs, but of the natives, Dr. Smyth says that three species have “suddenly practically disappeared.” Dr. Smyth indicated that their disappearance is dramatic, since these three were once virtually ubiquitous. Since crops attract and promote populations of the insect or animal species that ladybugs eat, they are often found in agricultural settings. 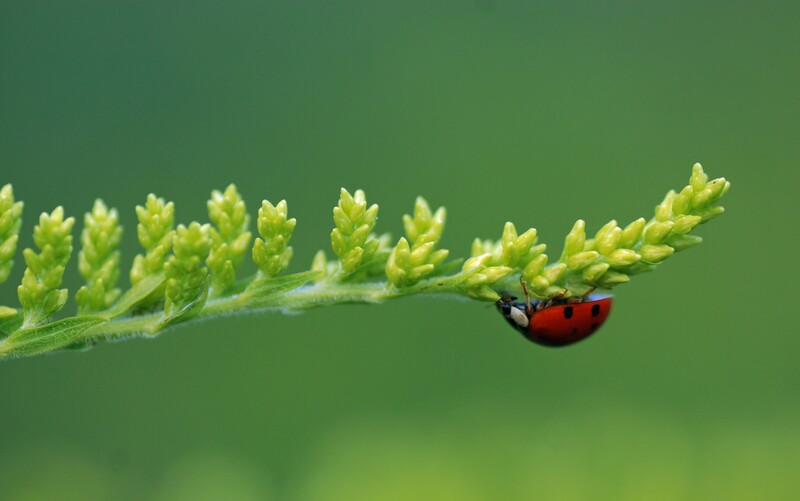 The ladybugs help control those species, especially aphids. Asked about whether ladybugs are disappearing overall, Dr. Smyth indicated that agricultural surveys of ladybugs do not seem to indicate an overall decline across all ladybug populations. As to ladybugs in non-agricultural settings, the Lost Ladybug Project hears primarily—or perhaps only—from those who have seen ladybugs. Dr. Smyth agreed it would be hard to determine whether there has been any overall population decline based on those reported—and necessarily—positive observations. Moreover, ladybug populations, like those of any other creature (except perhaps humans), vary somewhat based on yearly weather and other variable yearly conditions, so that it would be hard to say whether any observed decline in one year meant an overall decline. All of this makes it very important to assist the Lost Ladybug Project by reporting ladybug sightings, in order to increase the data available to them and to other researchers. Cycloneda munda found by Shelly Cox in Savannah, Missouri, October 5th, 2009. Shared with permission of the Lost Ladybug Project. Each species of ladybugs has its own “specialties” in terms of the habitat and microclimates which it prefers—and where it is most well-adapted. Some like high trees, some prefer lower areas. Even what the aphids are eating goes into ladybug location preferences—after all, the juice of each plant being sucked by aphids has a different chemical composition and each ladybug species tolerates a certain range of chemicals more easily. 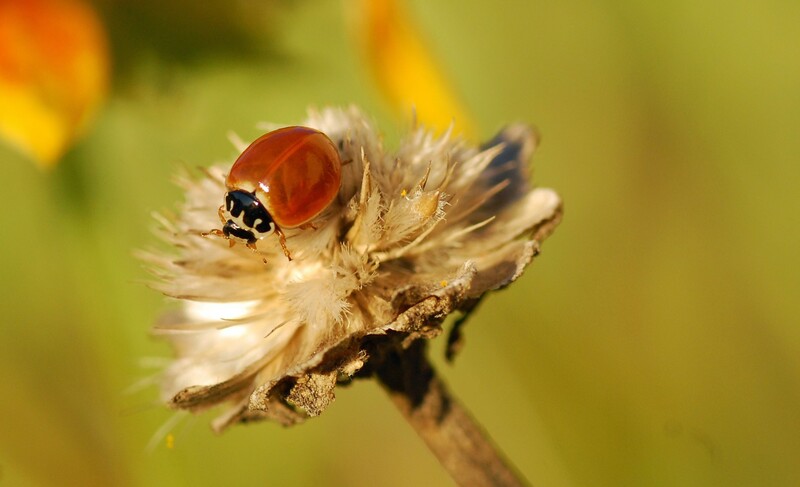 Since the presence of native plants is generally correlated to native ladybug development, planting native species which support ladybug food sources can help encourage native ladybug population growth. The chief reasons introduced Asian ladybugs have been more successful than natives is that, generally, the Asians eat faster and more of the ladybug foods and grow faster and better than their native counterparts. When asked to explain why I—and my local area of New Jersey with me—had crowds of Asian ladybugs invading our homes in 1993 and only a very few now, Dr. Smyth explained that when first introduced, a species like the Asian ladybugs experience fast population growth, then, over time, that growth and population itself subsides. She indicated that since 2008, the percentage of the Asian ladybugs and another currently dominant species, the seven spotted ladybugs, which was introduced from Europe, have not changed that much. Still, none of the ladybug species native to the Eastern United States was ever as dominant as these two have become. Humans appreciate ladybugs for their eating of various critters that eat our crops. I asked Dr. Smyth why humans should care about some species disappearing, if Asian ladybugs are eating aphids and the other soft-bodied insects that we want to see gone. Dr. Smyth pointed out that while current conditions support the dominance of the Asian and seven spotted ladybugs, conditions could easily change. In changed conditions, the species which have disappeared will likely not be able to rebound to pick up the slack. Moreover, even in the absence of changed conditions, when individual native species begin to disappear, their “specialties” in terms of where and what they ate as well as what plants they favored for finding food disappear, and, again, there may be no one available to perform the same ecosystem functions that they performed. More importantly, as one or two species become so dominant at the expense of others, the stability of the entire system is weakened. Likely, as the book A Gap in Nature indicates, we can expect the ladybug disappearances to cascade—or, as Ray Archuleta stated it, “there are no hardy species” (see the blog post “Connecting the Gap Between Humans and Nature” for more on the project behind the book, as well as Ray’s work as a soil scientist). When one species is threatened or eliminated, others begin to disappear as well. So what should we do? Should we all buy mass quantities of ladybugs and release them? Harmonia axyridis found by Shelly Cox in Savannah, Missouri, August 17th, 2009. Shared with permission of the Lost Ladybug Project. The ladybugs currently being sold are generally of the Hippodamia convergens variety (although web research suggests that Asian ladybugs, Harmonia axyridis, may be for sale as well). These ladybugs are collected from the wild, and the collection, mailing, and release processes all seem to impact survival negatively. Reported sightings of these ladybugs in the release areas reflect far fewer ladybugs than those reported released, which could, of course, also reflect a shortage of ladybug food. It is possible that released ladybugs are leaving the release area to find better food sources elsewhere. Dr. Smyth indicated that all this has led the Lost Ladybug Project to begin thinking about raising selected native species, and making these available to be released. In the meantime, she agreed with me that you need to look at the problem “at the landscape level,” and promote landscape in your yard which will, in turn, promote ladybug population growth and retention. So, the homeowner or school garden educator needs to be able to tolerate a certain level of continued aphid populations, and probably continued populations of other things we think of as “pests,” which serve as food sources for ladybugs—or other insects, birds, and other animals that we humans consider beneficial. In order to promote the continued existence of these food sources, we need to make sure we have plants for them to eat, which might include “trap crops” for aphids. We need to make space in our landscapes for a whole ecosystem, if we want any part of that ecosystem to be successful. This is the idea behind one of my new favorite books, The Living Landscape, by Rick Darke and Doug Tallamy. I will be reviewing the book in one or more future posts.